After many months of significant effort, we launched What Sales Winners Do Differently this week. This report reveals data and insight from our in-depth sales research on what sellers do to win sales opportunities. The results are both surprising and fascinating. Where selling was just a few years ago, where it is today, and where it’s going: these are pretty hot, and hotly debated, topics. No hedging in that title. Story over. The end. We agree that sales is changing, but the question is how. When we started this research, our goal was to find out what’s currently working in sales. Is solution selling really dead? If so, what should replace it? If not, since we know selling is changing, what do sellers need to do differently in order to find themselves in the winner’s circle more often? There are a lot of ways to skin the research cat. For our sales research, we analyzed over 700 business-to-business purchases from buyers that represent $3.1 billion in annual purchases. Below is an example of what we found. 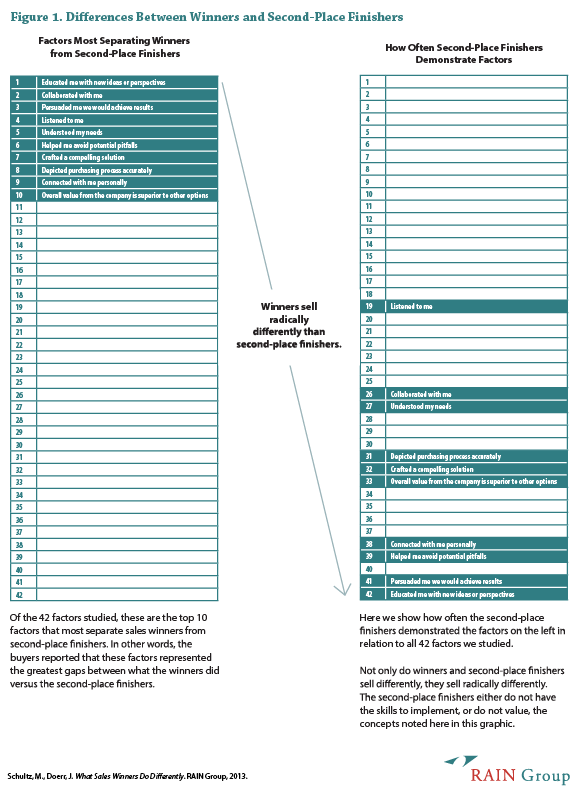 In the left column, you’ll see the top 10 factors that most separate sales winners from second-place finishers. In other words, buyers report that winners do these things to the greatest extent more often than second-place finishers. In the right column, you’ll see how often the second-place finishers demonstrate these behaviors and achieve these outcomes in relation to the other 42 factors we studied. The contrast is stark. The second-place finishers either don’t value the same selling behaviors that the winners value and buyers want, or they simply don’t have the skills to implement them. As you can see from this graphic, the sellers who won the sale don’t just sell differently; they sell radically differently than the sellers who came in second. Solution- and consultative-selling approaches need to evolve in important ways, especially to open the door for sellers to drive their own demand and create their own opportunities. Fundamentally, however, these approaches aren’t dead. They’re not even mostly dead. Sellers and companies that dismiss the core concepts of solution sales and replace them wholesale with something else place their sales success in grave danger. This isn’t the only area where we disagree with a number of people in the sales world about the direction of selling and sales approaches overall. Our findings especially clash with major points published in The Challenger Sale. The sellers who win have distinct patterns for how they sell. We’ve categorized and labeled these patterns in the Three Levels of RAIN SellingSM. Level 1 is Connect. Sellers who win connect the dots—they understand buyers’ needs and craft compelling solutions, and they connect with people—they listen to buyers and connect with them personally. These concepts are pretty fundamental to solution and relationship sales. In the report, we outline how the solution-selling concept needs to evolve, and what sellers must do along with it in order to win the most sales. Level 2 is Convince. Sellers who win persuade buyers the ROI case is worthwhile to pursue, and, at the same time, minimize the buyer’s perception of the risks of moving forward. Making the ROI case isn’t new—we expected ROI to be important, and it is—but the importance of risk reduction stands out more now than it has in the past. Reducing the perception of risk demands more attention from sellers. As well, sellers who win convince buyers they are the best choice among all available options. Level 3 is Collaborate. Sellers who win collaborate with buyers by being proactive, responsive, and easy to buy from. But it isn’t just collaboration regarding how the seller interacts with the buyer. The sellers who win are more likely to be perceived as collaborators in the sense of bringing new ideas and value to the table, and achieving mutual goals. In fact, these are two areas where the differences between the winners and the second-place finishers are starkest. Sellers who win connect, convince, and collaborate. Not only are these behaviors instrumental to winning the sale, they’re instrumental for the seller to win future sales, as they affect buyer satisfaction with the buying process, buyer loyalty, and buyer willingness to refer. 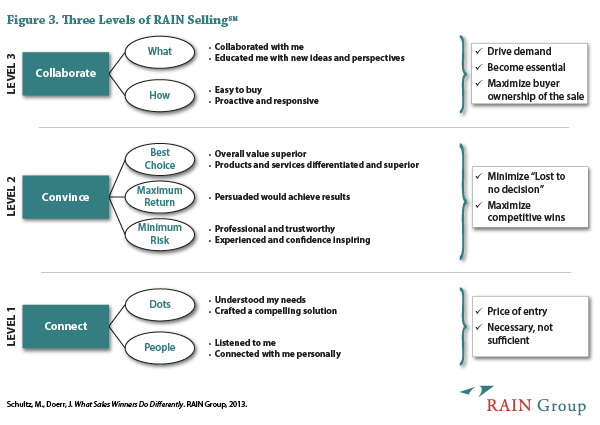 Those who know us, or who have read our Wall Street Journal bestseller Rainmaking Conversations, are familiar with RAIN SellingSM, our sales training methodology. We knew when we undertook this research that what we would find would likely influence our thinking and teaching. We didn’t care what the sales research showed, only that it would reveal how selling has changed, and what sellers need to do to win in the current buying environment. Now we know, and have updated our method and programs accordingly. You’ll find more detail of each of these areas and more in our new report, What Sales Winners Do Differently. We thought we would, however, share some of the key findings here on the blog so we can all interact. After you read the report, we look forward to your comments and questions. You may agree, you may disagree, and you may want to take the conversation in a completely new direction. We’re looking forward to interacting with you in any and all of these areas, and the continued pursuit of the discovery of the keys to success with the complex sale.